Paris, in its latest bid to be an innovator of the City of Tomorrow, is launching an electric car-sharing program to cut air and noise pollution on the city's medieval cobblestone streets and beyond. Autolib', a project built on the success of the city's bike-rental scheme, makes its debut Monday and officials want the self-service e-cars to be as much a part of Paris life as the Eiffel Tower or Notre Dame Cathedral. While many world cities have been developing greener alternatives to carbon-emitting vehicles, Paris says its program is the biggest of its kind: 250 vehicles hit the road on Monday, 2,000 are expected by next summer and 3,000 are planned within the next two years. The four-seat compact Bluecar — even though it's really gray — is a collaboration of Italian car designer Pininfarina and French conglomerate Groupe Bollore, which hopes to showcase its Lithium Metal Polymer battery that powers the car. Prospective users will need a valid ID, driver's license and credit card before signing up online or by a videoconference with an customer service representative at one of 40 special glassed-in shelters in Paris and dozens of suburban towns also taking part. Standard subscriptions cost euro10 ($13.5) a day, euro15 ($20) a week, and euro144 ($195) a year. Beyond that, the hourly fees run from euro4 to euro9 based on the rental plan — and users' cards can be charged in case of damage to the vehicles. To get going, users swipe a magnetized card against a driver's-side window to open the door, and a key tethered to the steering column starts the car. It comes with bells and whistles, literally — a button on the steering column lever produces a repetitive beep to alert Paris' many pedestrians that the silent car is on its way. "The city's first interest is fighting air pollution, these cars not only don't emit carbon dioxide but localized exhaust fumes either — and they don't make noise: (Studies show) the No. 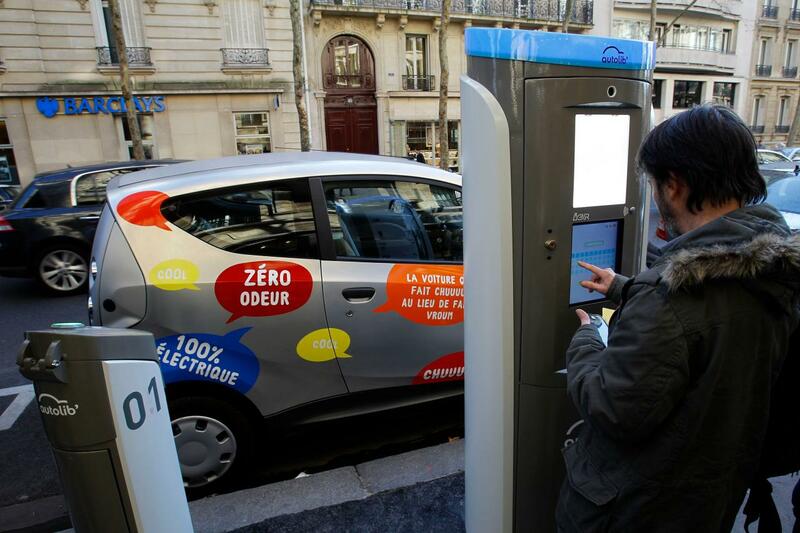 1 nuisance in the city is noise," said Sylvain Marty, who heads the multi-city Autolib' partnership led by Paris and private-sector affiliates. Autolib' also tackles what automotive analysts have long said is a big hurdle for the development of electric cars: a lack of infrastructure — not enough charging stations. For euro180 a year, owners of electric cars can use the spots to juice up their own vehicles at the Autolib' charging stations. For the last six months, crews with jackhammers have been outfitting sidewalks with some of the 1,200 charging stations and marking off parking spaces that will be reserved exclusively for Autolib' users. Those promoting the vehicle say it can run for 250 kilometers (150 miles) on a single charge. "I personally tried driving it more than four hours, in traffic, with the heat on full blast and I wasn't able to get it below 70 percent charge," said Marty. "For city use, that's more than enough." Some 2,000 people have already registered for Autolib' accounts, and curious city officials from places like Guangzhou, China, or Rio de Janeiro have traveled to Paris to check it out, Marty said. As is often France's wont, detractors and skeptics abound. The country's main Green party movement says the electric cars will drain more energy from France's nuclear plants, which they oppose; will require battery disposal; and will ultimately encourage people to drive more. City officials insist there's little risk to taxpayers, because the private sector companies have signed a 12-year commitment. Groupe Bollore, which is headed by a friend of conservative French President Nicolas Sarkozy, says at least 80,000 subscriber are needed for the program to be profitable — not expected for seven years, officials say. "We're banking on word of mouth from people who try it, like it, and tell themselves 'I've got to sign up!'" Marty said. Other cities have similar projects, but much smaller in scale. Berlin launched a pilot program last spring that combines a network of 40 electric cars and bicycles with the city's existing public transport system. Those cars, owned by German railway operator Deutsche Bahn, are part of a fleet of 65 electric vehicles also in Hamburg, Frankfurt and Saarbruecken. Switzerland's biggest car-sharing organization, Mobility, has started offering electric cars at some of its hundreds of pickup points across the country. Promoters know Autolib' is no panacea: Even at 3,000 vehicles, it won't be big enough to replace personal vehicles or public transport as the principal way of getting around a metro area of roughly 12 million people. "Autolib' is all about complementing other means of transport — this isn't about competing with public transportation or" the bike sharing program, said Marty.